Post Tagged with: "Combined Statistical Area"
What is Greater Western New York’s Greatest Hidden Gem? If Greater Western New York was a State, what would it be called? Find us on Facebook and LinkedIn, and subscribe to our newsletter or RSS feed to keep up with our latest content. Celebrating all there is to love about Western New York State, GreaterWesternNewYork.com covers art, commerce, cuisine, history, sports, real estate, nature...you name it. Don’t expect just another listings site. 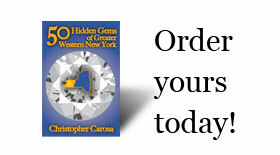 GreaterWesternNewYork.com is curated. Got an idea? We’re collecting the best resources on the web, and we’re looking for your suggestions! Got a pointer to a cool blog or an informative forum? Send us a tip. If you can’t think of a tip at the moment, no need to worry. Just send us your email address and we’ll keep you in the loop. If you specify your hometown and the kind of content you'd like to see, it will help us make this site a great resource for your community, so please consider doing do so.